Ford iPod/iPhone integration kit The FRD04-POD/S iPod interface allows you to connect your iPod/iPhone directly to the original Ford radio of many 2005-2010 Ford, Lincoln or Mercury vehicles with built in Satellite control functions Ford radio with Aux button and Mp3 logo. 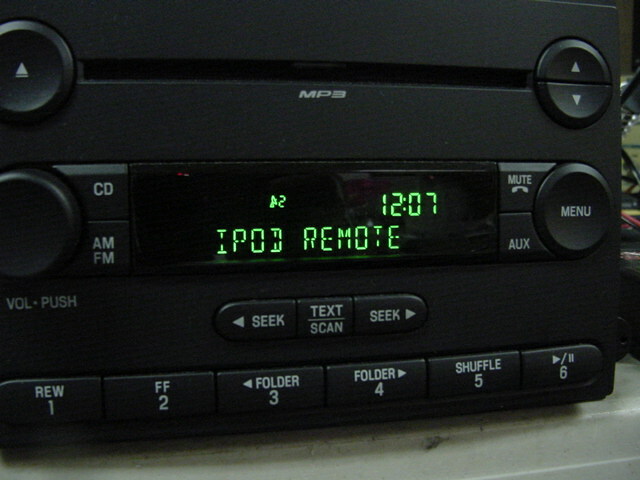 Using this interface, the iPod will take the place of the Ford Sirius satellite tuner, providing you with full iPod controls from the factory Ford radio. The FRD04-Pod/S also gives you the option of using the factory radio to control the iPod/iPhone or you can use the iPod controls . It also charges the iPod while the iPod is connected to the Ford radio. Works with new iPhone/iTouch and any older iPod The Ford radio’s satellite controls will be utilized to operate the iPod/iPhone allowing you to perform individual search by artist, album, playlist, and song title. In addition, your Ford radio will display iPod text fields in the following manner: Ford satellite radio must be unplug, it also charges 5 volts USB and 12 volt fire wire while the iPod is connected. If using and iPhone you can also stream music from internet services like Pandora, Livio radio, i-Heart radio or Sirius XM internet. 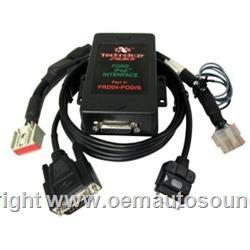 For aux audio input, use Ford auxiliary interface FRD04-AUX no controls or charging audio input only. Artist Name in 12 characters scroll down Ford radio pictures link. shown when doing a songs search. Artist Name in 12 characters. Playlist Name in 12 characters. Connects to the 16-pin connector at the rear of the Ford radio. Not compatible with navigation equipped vehicles unless so noted. Not compatible if equipped with factory satellite or factory DVD (RSE) equipment. Will work if you unplug the satellite radio or DVD Must have the "Aux" button on radio. Compatible with all iPod's, iPhone's, and iTouch. Compatible only with radio models 6C3T-18C869-AB 6C3T-18C869-AD 8C3T-18C815-FA only.